Assigned status Not reviewed by Peter A.Karth, MD on October 17, 2016. Ranibizumab (Lucentis; manufactured in the United States by Genentech/Roche) is a recombinant humanized IgG1 monoclonal antibody fragment that binds to and inhibits vascular endothelial growth factor A (VEGF-A). VEGF is a biochemical signal protein that promotes angiogenesis throughout the body and in the eye. Through binding to VEGF-A, ranibizumab interrupts the interaction of VEGF with its receptors, and thus prevents the subsequent growth of new blood vessels. Vascular endothelial growth factor (VEGF) is an important cytokine in angiogenesis (3). The VEGF family consists of VEGF-A, VEGF-B, VEGF-C, VEGF-D, and VEGF-E, and a placental growth factor (PIGF), all of which are placental-derived growth factors (PDGF). VEGF-A is the current target for treatment of retinal disease (12). It binds to the extracellular ligand-binding domain of two tyrosine kinase receptors: VEGFR-1 and VEGFR-2 (2,3). VEGFR-1 induces hematopoiesis, but exhibits weak tyrosine phosphorylation, an indication that the effects of VEGF-A on vascular endothelium occur mainly through VEGFR-2 (3,12) The interaction between VEGF and VEGFR-2 leads to dimerization and activation of an internal signaling pathway that alters the transcription of genes involved in angiogenesis and vascular permeability. In this cascade, VEGF-A availability acts as a rate-limiting step for angiogenesis and vasculogenesis (2,3). Evidence also shows that PIGF interacts with VEGF-A in these processes and blockage of PIGF is beneficial to some retinal conditions (12). Through alternative splicing, VEGF-A has 9 isoforms: VEGF121, VEGF145, VEGF148, VEGF162, VEGF165, VEGF165b, VEGF183, VEGF189, and VEGF206 (3,4). All of the isoforms function as dimers, but vary in their size and ability to bind heparin or neuropilins (12). The most physiologically relevant isotope is VEGF165 (3). VEGF165 is a secreted heparin-binding homodimeric 45-kDa glycoprotein with a significant fraction bound to the cell surface (4). When injected at the onset of hyperoxia, VEGF aids in the rescue of retinal vasculature and prevention of apoptotic death in endothelial cells, acting as a survival factor in vivo (23). VEGF also modulates endothelial metalloproteinase production, which contributes to its ability to promote tissue degradation and endothelial cell invasion (24). A4.6.1 antibody is one of the four antibodies of the IgG1 isotope that most effectively binds to and neutralizes VEGF121, VEGF165, and VEGF189. Ranibizumab is a 48-kD Fab fragment of the A4.6.1 antibody (1,3). Ranibizumab lacks an Fc region, allowing it to avoid Fc recycling and making it significantly smaller than the full-size antibody. The smaller size is thought to facilitate easier penetration into the the retina and faster clearance systemically; however, this may also expedite clearance from the vitreous (3,7). Ranibizumab binds to the receptor-binding site on VEGF-A, which inhibits the binding of VEGF molecules to their receptors on the surface of endothelial cells.3,6 Ranibizumab blocks all isoforms of VEGF-A (6). Each molecule of ranibizumab has only one binding site for VEGF, which implies that two molecules of ranibizumab are necessary to bind a VEGF dimer (7). Intravitreal ranibizumab injection (LUCENTIS; Genentech, Inc) was first approved by the FDA in 2006 for wet age-related macular degeneration. Since then it has been approved for the treatment of macular edema following retinal vein occlusion and diabetic macular edema. Most recently, it was was approved in 2015 for patients with diabetic retinopathy (10). The approved dose of intravitreal ranibizumab injection is either 0.3 or 0.5 mg in 0.05 mL. Dosing recommendations vary according to indications. Neovascular (Wet) Age-Related Macular Degeneration (AMD): The recommended dose for Ranibizumab is 0.5 mg (0.05 mL) administered once a month by an intravitreal injection. Macular Edema Following Retinal Vein Occlusion: The recommended dose for Ranibizumab is 0.5 mg (0.05 mL) administered once a month by an intravitreal injection. Diabetic Macular Edema (DME): The recommended dose for Ranibizumab is 0.3 mg (0.05 mL) administered once a month by an intravitreal injection. Diabetic Retinopathy (DR) with DME: The recommended dose for Ranibizumab is 0.3 mg (0.05 mL) administered once a month by an intravitreal injection. Actual treatment protocols vary, but may include strict monthly administrations, “as needed” (imaging and symptom guided) treatment, or variable prescribed injection intervals. These changes are dependent on disease, patient, and physician. Ranibizumab is supplied as a preservative-free, colorless to pale yellow, sterile solution placed in a single-use glass vial. The vial comes in two forms: 0.5 mg dose vial (delivers 0.05 mL of 10 mg/mL Ranibizumab) and 0.3 mg dose vial (delivers 0.05 mL of 6 mg/mL Ranibizumab). The contents of a vial of ranibizumab should be drawn using a 19-gauge filter needle. A sterile small gauge x ½ inch-needle should replace the filter needle for the injection. After giving the patient topical or local anaesthesia, the injection may be administered under controlled aseptic conditions. A new vial should be used for each eye. Patients should be monitored for endophthalmitis (5). 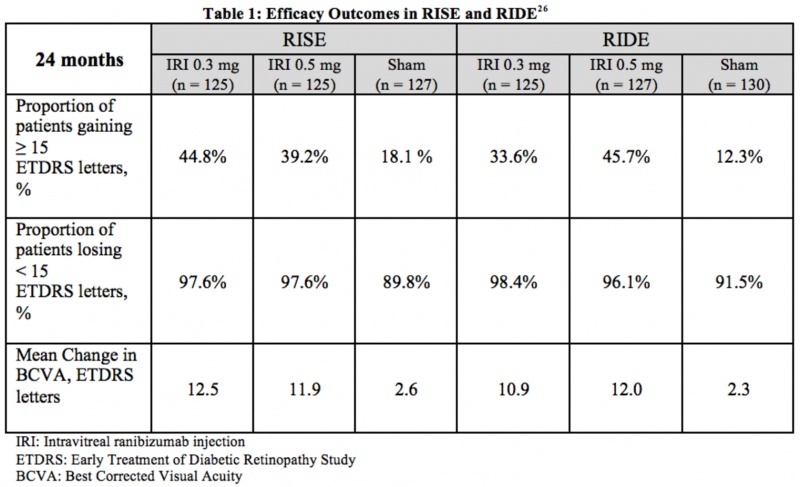 RISE and RIDE were two parallel, multicenter, double-masked, sham injection-controlled, and methodologically identical phase III studies that evaluated the efficacy and safety of 0.3 mg and 0.5 mg doses of intravitreal ranibizumab injections in patients suffering from diabetic macular edema. Across the two trials, 759 patients were randomized for monthly injections of intravitreal ranibizumab or sham injections. The primary endpoint at 24 months was the proportion of patients whose vision improved (gained 15+ ETDRS letters) from baseline. It was evident that patients receiving intravitreal ranibizumab had significant improvements in vision compared to the baseline. Additionally, these patients required much fewer macular laser procedures as a supplement to the treatment regime. Table 1 summarizes the efficacy results from RISE and RIDE (26). Adverse Events: Through 24 months, the most common adverse events included conjunctival hemorrhage, increased intraocular pressure, floaters, and eye pain, as expected from an intravitreal injection. In rare circumstances, patients suffered from serious side effects, such as endophthalmitis (4 patients) and retinal detachments (3 sham patients). Other, less common serious adverse events included cataract, intraocular inflammation, glaucoma, and vitreous hemorrhage. The rates of nonfatal myocardial infarctions, deaths from vascular or unknown causes, and nonfatal cerebrovascular events was 4.9% to 5.5% for sham patients and 2.4% to 8.8% for ranibizumab patients, which was not statistically significantly when compared to sham (25-27). Several years after the RISE and RIDE trials, the FDA approved ranibizumab for the treatment of diabetic retinopathy in the presence of DME. In these trials, there was a notable improvement in the Diabetic Retinopathy Severity Scores of patients with diabetic retinopathy after two years when compared to those who did not receive treatment (27). ANCHOR and MARINA were two-year, multicenter, double-blind studies that evaluated the efficacy of 0.3 mg and 0.5 mg doses of intravitreal ranibizumab for the treatment of neovascular age-related macular degeneration. In total, 1139 patients were randomized for monthly injections of intravitreal ranibizumab or sham injections. The primary endpoint at 12 months was the proportion of patients who maintained vision (defined as losing fewer than 15 ETDRS letters) from baseline. Over the course of two years, MARINA monitored 716 patients who received 24 monthly intravitreal injections, noting significant improvements in visual acuity and successful prevention of vision loss with few adverse events (28). ANCHOR compared ranibizumab to verteporfin therapy, using mean visual acuity and the area occupied by choroidal neovascularization as points of comparison. The study found that ranibizumab therapy decreased the area of CNV, while verteporfin therapy led to a mean increase, establishing the superiority of ranibizumab over verteporfin for the treatment of classic neovascular AMD (29). Table 2 summarizes the efficacy results from ANCHOR and MARINA. Adverse Events: In the ranibizumab-treated arms, the most common side effects were conjunctival hemorrhage, eye pain, increased intraocular pressure, and vitreous floaters, as might be expected. In less than one percent of patients, serious ocular events, such as endophthalmitis and intraocular inflammation, were observed. In both the MARINA and ANCHOR studies, cerebrovascular events and myocardial infarctions occurred in all three groups, with the combined rate of such events being slightly higher in the 0.5 mg ranibizumab group (33). 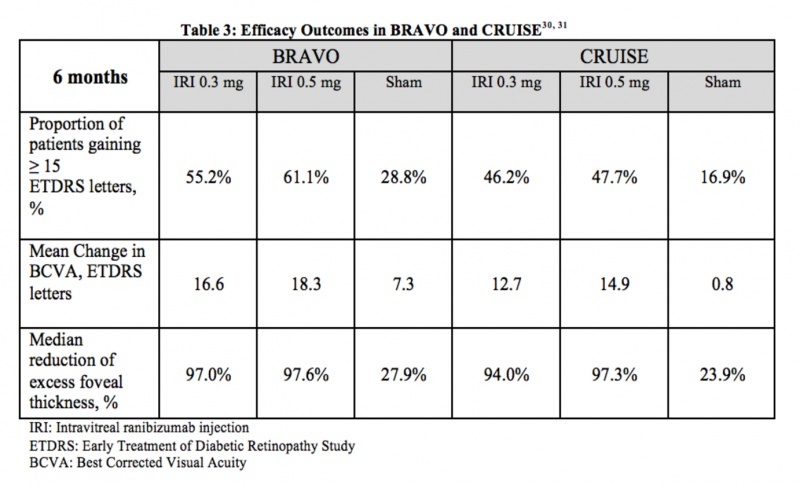 BRAVO and CRUISE were two multicenter, randomized, sham-controlled, double-masked clinical trials that evaluated the efficacy and safety of 0.3 mg and 0.5 mg doses of intravitreal ranibizumab in patients with macular edema following retinal vein occlusion. Across the two trials, 789 patients were randomized for monthly injections of intravitreal ranibizumab or sham injections. The primary endpoint at 6 months was the mean change in visual acuity letter score from baseline. Other parameters of visual function and central foveal thickness were also measured. In both trials, patients treated with ranibizumab required less rescue grid laser in comparison with patients in the sham group. BRAVO focused on macular edema following branch retinal vein occlusion, while CRUISE centered on central retinal vein occlusion. 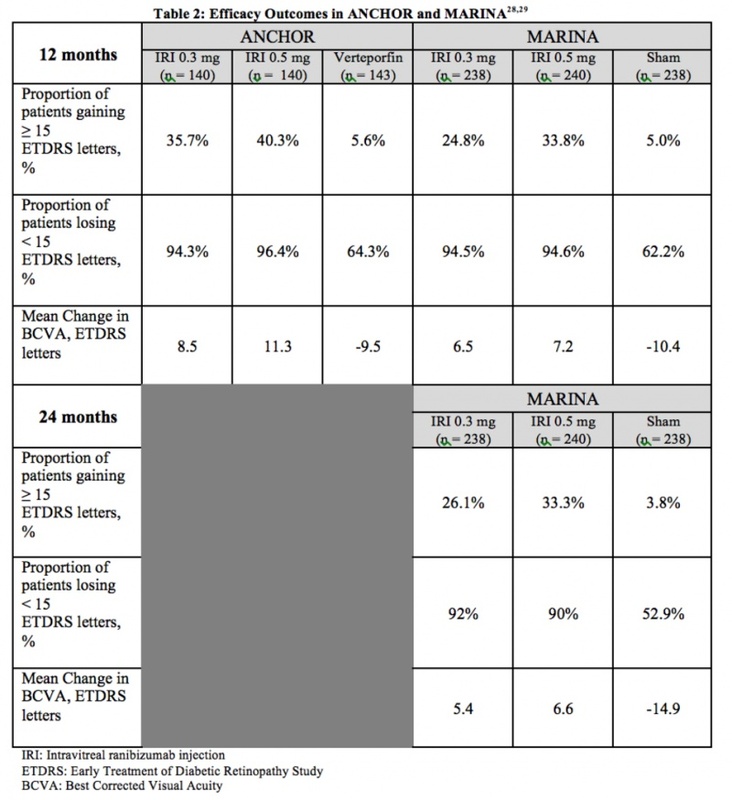 However, both studies noted a rapid, effective treatment for macular edema with low rates of adverse events (30,31) Table 3 summarizes the efficacy results from BRAVO and CRUISE. Adverse Events: The most common ocular adverse events in both studies were conjunctival hemorrhage (48%) and eye pain (17%). Serious non-ocular adverse events in BRAVO included one arterial thromboembolic event in the sham group, and two in the ranibizumab 0.5 dose group. Moreover, there was one myocardial infarction and one cerebrovascular accident that resulted in death. In CRUISE, such events were uncommon, limited to one case of either myocardial infarction or acute coronary syndrome in each group (32). Several major warnings have been noted for the use of ranibizumab and other intraocular drugs. Endophthalmitis and retinal detachments can occur on rare occasions after any intravitreal injection, including the intravitreal ranibizumab injection. On average, about 0.02% of patients using ranibizumab developed infectious endophthalmitis (11). Patients must self-monitor after the injection for signs of infection, such as diffuse redness, decreasing vision, or worsening pain 24 hours after the injection. The ranibizumab clinical trials report a low risk for arterial thromboembolic events after the use of VEGF inhibitors, including intravitreal ranibizumab injection. The most commonly reported adverse reactions (>10%) included conjunctival hemorrhage, vitreous floaters, cataract, vitreous detachment, increased intraocular pressure, and eye pain (5). These occasionally occur with any intravitreal injection. In ophthalmology, intravitreal ranibizumab, bevacizumab, and aflibercept are the most commonly used anti-VEGF treatments for retinal disease. As mentioned above, ranibizumab is a 48-kD antigen-binding antibody fragment that binds to VEGF.3,6 In a similar fashion, bevacizumab binds to the receptor-binding sites of VEGF-A molecules. However, bevacizumab is a much larger molecule since it is the entire recombinant, humanized antibody. Bevacizumab binds to several VEGF molecules at one time, where ranibizumab can only bind to a single ligand molecule (12). Aflibercept is a soluble decoy receptor that fuses Ig domains of VEGFR-1 and VEGFR-2 with the Fc region of IgG1. It functions by binding to VEGF with a higher affinity than its natural receptors. Along with all isoforms of VEGF-A, Aflibercept uniquely binds to VEGF-B and PIGF (12). Both ranibizumab and aflibercept have been FDA-approved for the treatment of diabetic retinopathy in DME, diabetic macular edema, and wet-AMD, and macular edema in branch and central vein occlusions.10,20 While bevacizumab is not FDA-approved for ophthalmological uses, it is used off-label to treat diabetic retinopathy in DME, diabetic macular edema, and wet-AMD, macular edema in branch and central vein occlusions, and various other vascular-related eye problems. Of these three, bevacizumab is currently the most commonly used treatment in the USA. The use of ranibizumab is largely confined to retinal disease, but aflibercept and bevacizumab have more versatile applications in medicine. Ziv-aflibercept is a form of aflibercept that has been modified for intravenous infusion. In conjunction with 5-fluorouracil, leucovorin, and irinotecan (FOLFIRI), it is used for the treatment of metastatic colorectal cancer (mCRC) that had become resistant to standard treatment regimes (19). Bevacizumab has been FDA-approved for colon cancer, but is used off label in ophthalmology. It has been noted to increase the response rates with chemotherapy in a multitude of tumors types studied in phase III trials (16). Since its initial approval for the treatment of metastatic colorectal cancer in 2004, Bevacizumab alongside chemotherapy has been influential in treating several types of cancers, including lung cancer, HER2-negative breast cancer, brain cancer, kidney cancer, metastatic cervical cancer, and ovarian cancer (15,21). In their clinical doses, ranibizumab and bevacizumab have an almost identical effect on VEGF. Both agents significantly bind to VEGF up to 16 hours after application in vitro.13 Although ranibizumab and bevacizumab are both highly efficient in neutralizing VEGF, ranibizumab exhibits a 17-fold higher binding capacity and 6-fold higher binding affinity when highly diluted (6,13). However, both of these drugs have lower binding capacities when compared to aflibercept (VEGF Trap) in vivo. The dissociation constant of aflibercept measured at 0.66, and ranibizumab and bevacizumab followed at 20.6 and 35.1, respectively. This indicates that the binding affinity for aflibercept is approximately 100-fold higher than those of ranibizumab and bevacizumab (12). Other studies indicate that aflibercept has more long-term effects in organ cultures than the same concentrations of ranibizumab and bevacizumab. Aflibercept successfully inhibited VEGF for an entire 7 day period, but ranibizumab only displayed significant inhibition for 72 hours. Furthermore, bevacizumab displayed inhibition for just 48 hours. In terms of prolonged VEGF inhibition, the study ranked aflibercept as the most effective, followed by ranibizumab, and bevacizumab as the least effective. Aflibercept and ranibizumab were more close competitors, since aflibercept was only superior to ranibizumab at one of the tested concentrations (17). In 2012, the Diabetic Retinopathy Clinical Research Network conducted a year long randomized clinical trial of 660 patients to compare the effects of intravitreal aflibercept, bevacizumab, and ranibizumab on diabetic macular edema. In patients with 20/40 vision or better, the mean improvement in visual acuity was similar between agents (no statistically significant difference). In patients with 20/50 vision or worse, the mean improvement was highest in aflibercept (statistically significant), which was slightly more efficacious than ranibizumab, and bevacizumab (22). On average, patients receiving aflibercept required fewer injections (one less per year) than patients receiving ranibizumab or bevacizumab, although this was not statistically significant. Additionally, laser photocoagulation was performed fewer times in eyes that were treated with aflibercept, suggesting that aflibercept was more effective for the resolution of central-subfield-involved diabetic macular edema.The rate of adverse effects was similar among all three medicines; however, the study confirmed that all three intravitreal injections were safe and effective. In a cumulative study of AMD, data from 11 different trials of 8,341 patients using five active treatments were analyzed and assessed. It was determined that all anti-VEGF treatments induced significant gains in vision when compared to placebo. The study also revealed that the two treatments with the highest percentage of letters gained were ranibizumab 0.5 mg at 3.56% and aflibercept 2 mg at 3.44%. The lowest percentage gain was attributed to bevacizumab 1.25 mg at 2.14% (14). Both ranibizumab and aflibercept are relatively expensive injections, at approximately $1,850 and $1,950 per dose, respectively (15,18) However, trial results show that patients receiving aflibercept tend to require fewer injections than those receiving ranibizumab, and thus aflibercept has a lower long-term cost per patient than ranibizumab (18) Physicians can obtain compounded bevacizumab for intraocular injections at a cost between $17 and $50 (15). Turbert D, Janigian RH. Lucentis. American Academy of Ophthalmology. EyeSmart® Eye health. https://www.aao.org/eye-health/drugs/lucentis-list. Accessed March 07, 2019. S. L. (2008). Therapeutic Anti-VEGF Antibodies. In H. B. Lowman (Ed. ), Handbook of Experimental Pharmacology (Vol. 181, pp. 131-150). Springer Berlin Heidelberg. LUCENTIS® ranibizumab injection full U.S. prescribing information. (2015, February). Retrieved September 11, 2016. This page was last modified on April 22, 2019, at 15:43.